The following is a brief summary of our modules and most popular bundles. Click on each link for a detailed description and sample documents. Everything you need to get started. The Pest Control Bundle includes the Billing & Contacts Module, Contact Manager and Photo Manager. 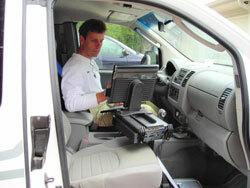 Includes NPMA-33 and all state termite inspection forms in an easy to use format. Also includes Photo Manager. Create and store email messages and contact reports, view history at a glance and much more. Includes Bid and Contract Modules. enables you to quickly and easily create your own customized Bids and Contracts. A picture is worth a thousand words. Display 2, 4 or 6 photos per page, each with it's own caption. A great marketing tool for attracting builders. Both NPCA 99a and NPCA 99b forms are included. With the WDI FX Chemical Tracking Module you can create chemical reports, by address, for any time period. Allows you to quickly find all treatment and service guarantees that are expiring during a given time period. Create professional looking letters, complete with color logos and signatures, which can be printed or emailed to your clients. Create a variety of custom contracts complete with Line items so there is no confusion as what services are being ordered. Synchronize any customer record, invoice or service ticket, and payments. Works with QuickBooks Online, Pro, Premier and Enterprise. * iOS Mobile and Mobile Network included at no extra charge with our Full Suite Subscription shown above as well as our sister product SmartPest Paperless Office. There is a one time charge of $99 to set up each single user subscription account (see below for multi-user accounts). Please note, you pay NO support or upgrade fees with the subscription plan....it's all built into the monthly subscription and modules can be added or removed with a simple phone call. All subscription fees must be prepaid by credit card and the first three months must be paid in advance. Subscriptions renew automatically unless cancelled in writing 7 days prior to expiration. After the first quarter, we will process your credit card automatically every month and you will receive a receipt from PayPal upon successful payment processing. Failure to maintain a current card on file may result in a suspension of service. WDI FX works with QuickBooks® through an optional third party plugin. When WDI FX is first installed the demo version will operate for 7 days allowing you to import all your contacts, open invoices and services. Works with QuickBooks Pro, Premier or Enterprise. MULTI-USER NETWORKS - New Image Software offers SmartPest Paperless Office for multi-user organizations. SmartPest includes ALL the modules shown above which are hosted in our professional data center. For further information see www.smartpestsoftware.com. We offer data conversion for most service and pest control software programs. Contact our office for a quotation. *Paid in advance via credit card. Set up fees, data converson, due at time of order. iOS subscriptions require FileMaker Go, available free on the App Store. 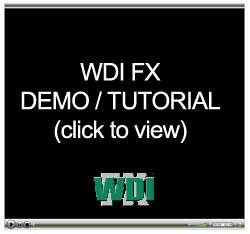 **New Image Software created WDI FX on the FileMaker Pro platform. There is a support charge of $39 per 15 minutes of Live Help Support if you require our assistance in making changes or repairs to layouts. Customized layouts must be manually transferred to upgraded versions of WDI FX.